In the normal world, it's what you'd call a bad investment: Spending $2 billion to build the largest moveable structure ever—and knowing that it won't work for longer than 100 years. But in Chernobyl, it's the best available option for protecting a whole continent from the worst nuclear disaster in history. Today is the 28th anniversary of the disaster, which killed 31 and subjects hundreds of others to extreme suffering, and left 200 tons of radioactive corium and 16 tons of uranium and plutonium exposed inside the smoking remains of Reactor 4. At the time, heroic workers quickly constructed an ad hoc shelter over the reactor to stop the spew of radioactive material across Ukraine and Western Europe, using 7,000 metric tons of metal and many more tons of concrete. But that shelter—known as the Sarcophagus—was never meant to last. And now, it's in danger of collapsing. The Sarcophagus. Image via CHNPP. 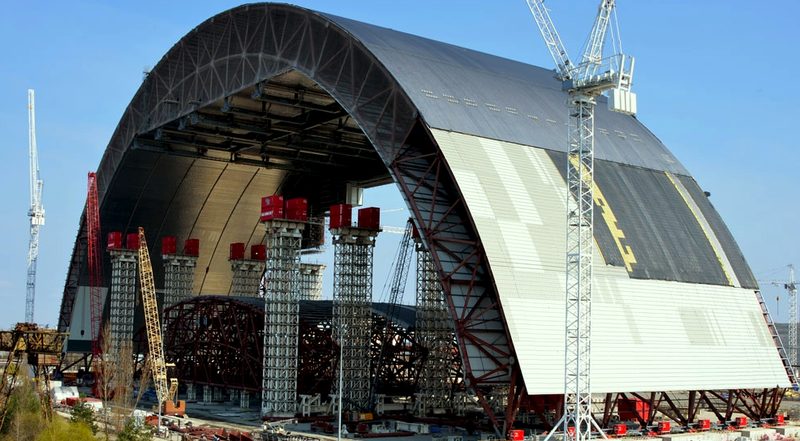 Enter New Safe Confinement, a project that's nearly as old as the meltdown it's designed to contain. It's a two-pronged plan: First, thousands of workers are constructing a 300-foot-tall steel arch that weighs more than 32,000-tons. Though it's being built a few hundred meters away from Reactor 4, it's eventually going to cover it, creating a thick steel cage around the reactor in case it collapses. But because the area near it is too radioactive for workers to stay there for longer than a few minutes, this huge structure is being built next door—then, very very slowly, it will be slid on teflon-coated tracks to cover the reactor.